Make your reservation and send your arrival times and flight details to us the email will be on your confirmation email. 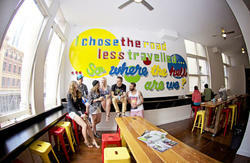 Nomads St Kilda Beach is an institution when it comes to backpacker hostels in Melbourne. Located in the heart of St Kilda, the budget conscious traveler never ending memories. We insist that you must have loads of fun when staying us. We cater for all types of travelers. 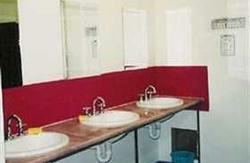 We have 16 bed dorms all the way down to 4 bed dorms both with and without ensuites. For the quieter type or couples, we also have twin, single and doubles available. Our rates are very reasonable, so as not to break the budget, therefore allowing you to get out and enjoy what this beautiful city has to offer. As well as spending some of your hard earned in our bar!! The bar is opened from 11am right through to 11pm. Our beer prices start at $4 a stubbie. $1 coffee is available all day, everyday! And new and better WiFi hotspots with free WiFi on Ground Floor. Free BBQ on our rooftop on Sundays! 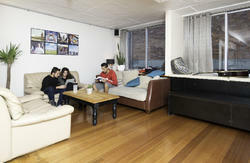 We are one of the longest serving hostels in Melbourne. From Tullamarine Airport the Coffee Palace is so easy to get to. There are a couple of ways you can choose. At the airport there is a bus service called the Skybus. (operates 24/7) It brings you into the major Bus and Train terminal in the city, Southern Cross Station. Once you have arrived at Southern Cross Station, catch the No. 96 Tram from the corner of Spencer Street and Bourke St. Once you're on the tram, just head for Fitzroy St, St Kilda. Get off at Grey St and walk up the road. We're just on the left. Look for the orange Coffee Palace signs. We are the first hostel you will pass. From Avalon you hop on the Sunbus Shuttle to Southern Cross Station then the tram to St Kilda.